Well, it’s been a while, but we are back at it this Sunday from 1-4pm. Won’t you join us for a lovely afternoon of needlework and friends? The coffee and tea are waiting for you. DFW Fiberfest was a great sucess and we sold a lot of our goodies. Fear not! The boxes are once again arriving daily to restock the shelves. We took advantage of having everything emptied out of the showroom for FF and did a little re-arranging as we restocked too. 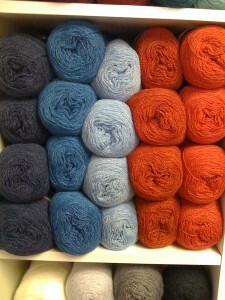 Added to the showroom are the Accidental Knitter hand-dyed yarns. Come by and check out the selection, it’s going fast! Patrice (the Accidental Knitter) has relocated to Michigan and we have the remains of her inventory. Hopefully she will be dyeing again soon but what is here is 25% off the marked price. We did sell out of most all the Namaste’ goodies. We have re-ordered and expect the newest shipment in early May. If there was something you wanted it is NOT too late to get your requests in for this shipment. Call or email today! 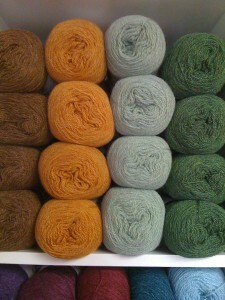 We also managed to find some new yarns to offer for your fibery pleasure, Jaggerspun Zephyr Laceweight in 18 colors. $9.95/560 yard ball/50 grams this gorgeous yarn is 50% fine grade Merino wool and 50% Chinese Tussah silk. Come by and see the lace shawls that have been knitted in this yarn that we have on display.